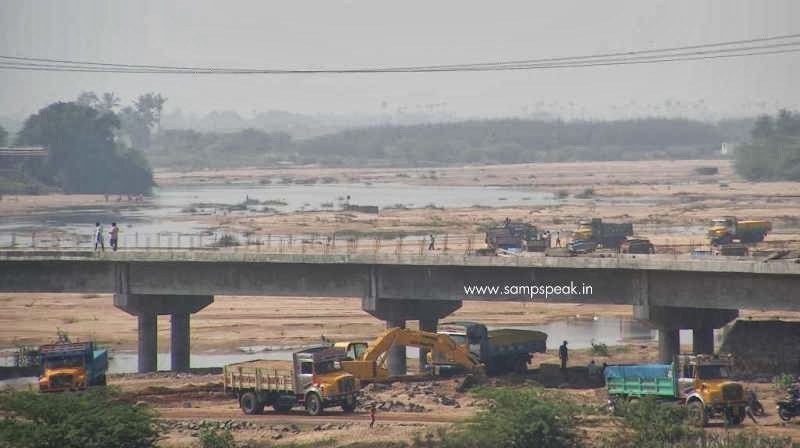 Palar which rises in Nandi Hills, Kolar flows into Tamilnadu and finally joins Bay of Bengal …. it runs near Kanchipuram ~ I have not seen water flowing in this river (perhaps in those days when my father had to cross it daily for coming to school, there was much of water to be crossed )……… In the Palar river basin, one can see – trucks, tractors and bullock-carts – all carting river sand…..most of that is illegal.. illegal sandmining is rampant….. you replace Palar with other river, the situation is more or less the same.. !! ~ there are mining sites – hundreds of men and women work with shovels at a frenzied pace. Sand mining is a practice of extracting sand from an open pit. Sand is mined an dredged from beaches, inland dunes, ocean beds and river beds. Sand is used in manufacturing as an abrasive, for rich minerals contained and for construction purposes. The first sensational revelation in the Bofors scandal was made in 1987, more than 25 years ago, when the Swedish National Radio reported that bribes had been paid to top Indian politicians to secure the howitzer gun contract. Years have passed by, none of the principal beneficiaries of the illegal payoffs have been convicted, and not a single paisa of the Rs 64 crore was ever recovered…. It has been a story of massive cover-up and deception. It cost the ruling party the government….. Opposition parties extracted much political mileage from it – VP Singh campaigned on the anti-corruption platform in 1989 and won, did precious little in convicting or recovering … the Q got away so easily aided and abetted by successive Governments. About half a century and a decade ago … in 1957 there was the Mundhra scam…. Where Mundhra got the Govt owned LIC to invest Rs.1.24 crores in the shares of six troubled companies belonging to him. The investment was done under governmental pressure and by-passed the LIC’s investment committee. Today you may think that to be a paltry amount…. Decades later came the Bofors scandal – which ought not be weighed in monetary measures alone as it related to purchases of ammunition for the Indian army. The scandal reportedly implicated Congress of receiving kickbacks from Bofors AB for winning a bid to supply India's 155 mm field howitzer. The Swedish company reportedly paid 640 million (US$10 million) in kickbacks to top Indian politicians and key defence officials. Subsequently we have heard of bigger scams each fading the earlier ones…. Now comes the Odisha illegal mining scam amounting to Rs. 59,203 crore and illegal iron and manganese ore amounting to 22.80 crore tonnes extracted illegally from the state for almost a decade, the Shah Commission report is quoted as saying. It has demanded a CBI investigation into the matter, warning that too many powerful people, businessmen from Odisha and outside the state, bureaucrats and politicians are involved. The Hindu mentions of accessing more parts and contents of the report which the government has classified as secret and asked the Supreme Court not to put out. There is demand for a CBI inquiry not only in to the illegal mining, but also the attendant railway freight scam and linked evasion of excise duty by the mining companies. It is one of the most scathing reports to come out of the stable of Justice M.B. Shah Commission on illegal iron and manganese ore mining as yet and it holds businessmen, state government and the centre, all responsible for the systematic exploitation of natural resources and linked rampant corruption. According to an article in The Hindu – the report says, “All modes of illegal mining a are being committed in the state of Odisha. There is a complete disregard and contempt for law and lawful authorities on the part of many among emerging breed of entrepreneurs, taking undue advantage of country's natural non renewable assets and resources for export earnings.” It adds, “The pursuit of super profits has absolutely drained them of any feeling for fellow human beings/for nation and the moral values. The law has been made helpless because of its systematic non implementation.” The Shah Commission goes on to list each company that mined thousands of crores of ore in blatant disregard of all mining and environmental laws. In some cases it notes that mines ran illegally for more than two decades. “The Hindu had earlier reported the gross violation of environmental laws elaborated in the report. At this rate all the iron ore reserves in the state would be exhausted in 30 years. The miners have made a killing out of the illegal exploitation of natural resources, the Commission writes. Even while the miners have turned billionaires, the commission notes how the labour- the displaced tribals - are ill-treated. “Mine owners do not pay more than minimum wages to the labourers even though their income is more than billions of rupees. They have no idea or intention of paying fair wages. Labourers are exploited and the object of seeing that locals benefit is frustrated.” The panel also records how the current system of allotting mining rights is based on political discretion of both the state and the centre, the open to corruption. Public memory is short-lived as one new scam after the other wipes out all memories of the previous scam….. poor mango people continue to live in banana republic..